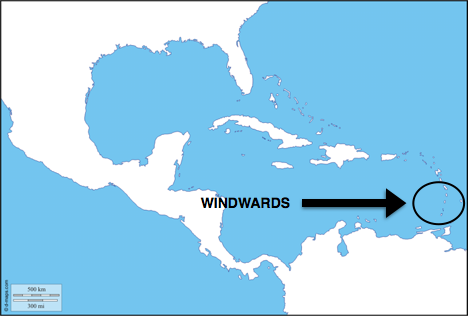 The Grenadines (Bequia, Mustique, Canouan, Mayreau, Tobago Cays, Union Island, Petit St. Vincent, Petit Martinique, and Carriacou) are considered part of the Windward Island chain, however we feel it deserves its own section in that the Grenadines are a special sailing ground. Like the Virgin Islands, the Grenadines are an archipelago of islands, stretched a little further apart, this is ultimate sailing grounds for those desiring for a little more offshore sailing. They are far enough that you can spend several hours sailing, but close enough that it is still an easy cruising ground. The Easterly trade winds offer ideal sailing conditions for it always lies on your beam as you sail along the chain North or South. The Grenadines to the North belong to St. Vincent and the Grenadines to the South belong to Grenada. You can access these island via airports on either major island as well as small flights to the inner islands from Barbados. *This is just a SAMPLE. Any details are subject to weather and options available to the crew and boat at the time. Arrive to St. Vincent and meet your boat at Young Island. Depart the bay and anchor at Fort Duvernette where you can snorkel ashore to climb and explore the tall rocky pinnacle that is home to the elevated cannon battery of Fort Duvernette. Sail down to Mayreau and anchor in Saltwhistle Bay, behind an idyllic stretch of lowlying land of sand and palm trees that looks out over the Tobago Cays. Here you will enjoy fresh breeze and calm waters to swim in or have fun with a game of horseshoes ashore on Mayreau. Sail down to Petit St. Vincent. Revel in the quiet anchorage, take a walk around Petit St. Vincent if you like, enjoy their beachside restaurant and bar, or take a dinghy out to Mopion, an ever changing shift of sand in shallow waters on which stands a sole palm frond shade. Sail back to Clifton Harbor, Union Island, explore some of the most colorful market huts in the Caribbean and savor the taste of the Union Island pineapple, the smallest, whitest pineapple with the tastiest flesh. These ladies sell phenomenal produce, spices and other goodies. Visit Janti “Happy” on Happy Island while your Captain clears out of customs. Janti started Happy Island out of a pile of discarded conch shells lying on the reef, and what was once small enough for just a cooler and a shade, over the years it has been added onto and developed into a friendly bar/ getaway that would make Jimmy Buffett jealous. Head around to Chatham Bay for the afternoon, enjoying a beach walk, swim or water sports. A short run will take you over to the Tobago Cays, where you will find crystal clear turquoise water, and have the opportunity to snorkel with many turtles in what is protected marine park. Have fun meeting the local boat boys that arrive from Union Island to sell fresh fish, t-shirts or fresh baked bread and opt for dinner as a BBQ made by one of them on the beach of Petit Rameau . They set up a fantastic spread with grilled lobster, fish, stewed lambie (conch), plantains, salad, and much more. A morning sail will be a perfect beam reach north to Bequia, where you will arrive to anchor off Princess Margaret Beach, walk through the small town experiencing the amazing fresh outdoor markets and handcrafts sold. Continue on along to admire the locally made Bequia sloops, and find the boardwalk that lines Admiralty Bay, which reveals more shops, restaurants and bars and ends at the white sandy beach of Princess Margaret Beach and if you like, hire a jeep to take a tour of Bequia and its beauty and be sure to check out the Turtle Sanctuary. We look forward to sending good vibes with information, updates and special offers for a fantastic vacation!